The global soap noodles market has been foreseen to witness a competition that hinges on supply consistency and price of products, according to Transparency Market Research (TMR). Players capable of operating in an environment of vast volume supply and holding a top-of-the-line cost structure could fancy more chances of survival in the global soap noodles market. When the growth in demand lowers the rate of capacity addition, even large players could feel the negative impact of profitability loss in the global soap noodles market. Small companies have been prognosticated to pose some threat in the global soap noodles market, provided they manufacture at cheaper costs and accomplish economies of scale. As per a statistical analysis by TMR, the world soap noodles market could attain a CAGR of 2.7% during the forecast period 2016–2024. In 2016, the world soap noodles market had pulled in a revenue of US$2.64 bn. 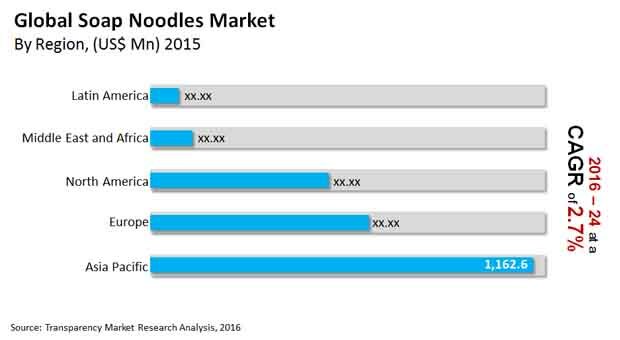 However, by 2024, the revenue earnings of the world soap noodles market could reach a US$3.28 bn. According to source type, vegetable oil has been envisioned to rake in an overriding share of US$1.99 bn in the world soap noodles market by the concluding forecast year. Geographically, Asia Pacific could be a leading shareholder in the world soap noodles market by the same year with a 49.2% share under its name. The international soap noodles market has been envisaged to register a handsome demand as less developed countries of Asia Pacific become increasingly aware about hygiene and high standards of living. The application of soap noodles in soap bars further redeveloped into medicated, translucent, laundry, and toilet soaps could help the international soap noodles market augment its growth. Certain regulations of the European Parliament and Council handicap the usage of substitutes such as nonylphenol polyoxyethylene ether (NPE) during soap and detergent formulation. This has been predicted to be a great advantage for the international soap noodles market. The demand in the global soap noodles market could be expansively driven by hot sales and promotions as consumers are researched to be influenced by stock piling and purchase acceleration effects. As a result, such consumers have been foretold to purchase additional quantities of soap products during promotional activities, leading to an increased growth in the global soap noodles market. Projected to spread its presence globally at an 11.6% CAGR during the forecast period, the hand sanitizer market could pose a threat to the world soap noodles market. The growing popularity of other substitutes such as shower gels, body wash, and liquid hand wash in developed regions on account of changing lifestyles and consumer preference has also been anticipated to impede the growth of the world soap noodles market. Howbeit, despite the rise of substitutes, the global soap noodles market could be advantaged with the introduction of moisturizing, anti-bacterial, aromatherapy, herbal, and other functional soap bars. Moreover, soap manufacturers pampered with a secure supply source of raw materials have been expected to in turn boost the global soap noodles market growth. This could be due to the rise of toll manufacturing because of the inflating consolidation of soap manufacturers.